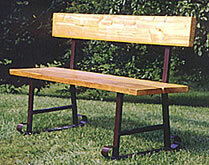 We manufacture picnic table frames, campfire grills, and campfire rings for parks and camprounds. Chadwick Manufacturing has been a leading manufacturer of high quality picnic table frames, park benches, campfire grills, and campground fire rings to parks and campgrounds for over fifty years. Located in the small Northwestern Illinois town of Chadwick we have been at this same location since the beginning of our quest to make only the finest quality picnic table frames and campground equipment. The quality picnic table frames that Chadwick Manufacturing make are one piece welded end frames and the walk through frames are constructed from heavy 14 gauge steel tubing and are available in brown enamel or galvanized. Assembly is easy using your lumber and our 1 1/2" structural self-tapping screws. There are no holes to drill and no bolt heads protrude on the top or seats. Plated carriage bolts are optional. The cook grills and fire rings manufactures by Chadwick manufacturing are a delight to use even if you just want to sit by the fireside and enjoy an evening by the campfire. The sliding grill makes cooking your hamburgers, hotdogs or your favorite steaks over an open fire an experience that the entire family will enjoy. Or just slide the grill back and cook your hotdogs or marshmallows on a stick. Our grills and fire rings are constructed using 3/16" gauge steel with heavy 1/2" grill bars that will provide you with years of cooking and campfire fun. Our waist high grills, that you may have seen in many parks, are available for setting in concrete with a 42" post or we also have portable units. The waist high grills are made of the same high quality materials that the cook grills and fire rings are made of. The finish is a rust resistant black enamel.